Below are my amateurish pictures of some of the stained glass windows from St. Joseph the Workman Cathedral in La Crosse, WI. There were many other beautiful windows as well. I was interested in these particular ones because they relate to Wisconsin Catholic history. Thanks to Jean McDonnell at the Cathedral for her help with this project. 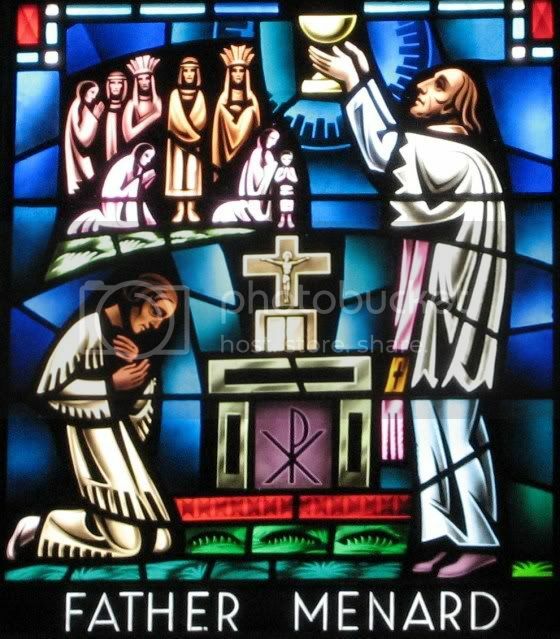 Father Rene' Menard, S. J.
Indians Being Baptized by Father Jean Claude Allouez, S.J. Do you see the badger in this picture? 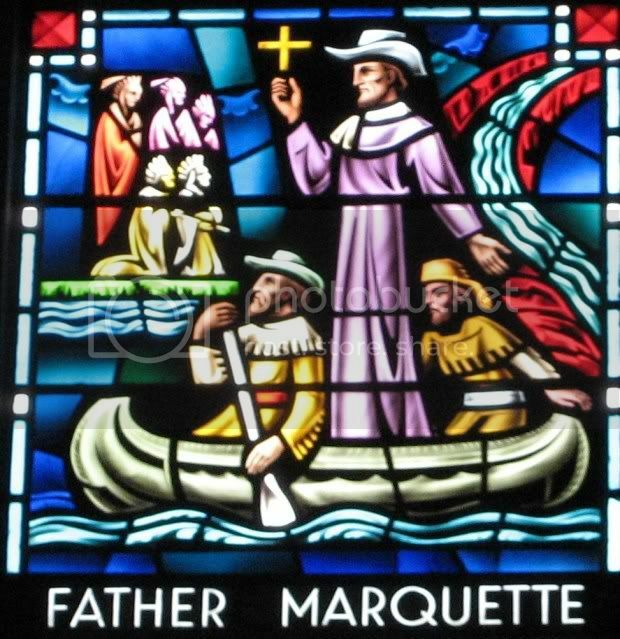 Father Jacques Marquette, S.J. Comes Down the Wisconsin River to the Mississippi. 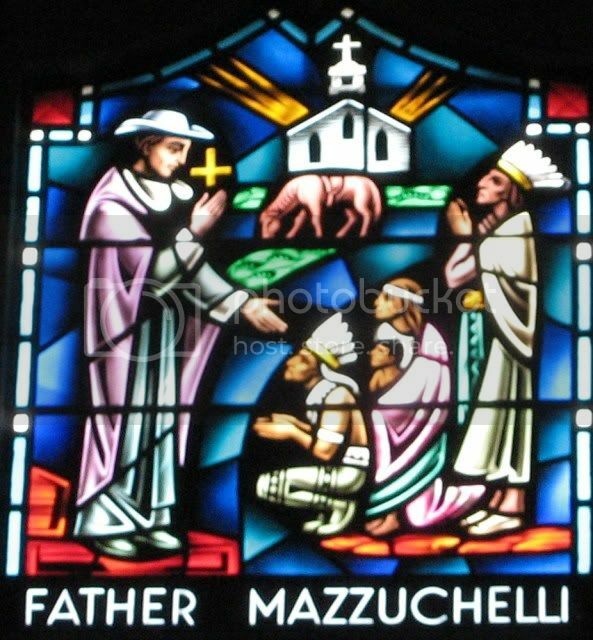 Father Samuel Charles Mazzuchelli, O.P. Here he is shown in 1844 in front of St. Augustine Church at New Diggings, WI. He was the builder and architect and you can still visit this church today. St. Joseph the Workman Cathedral, the Mother Church of the Diocese of La Crosse, was consecrated in 1969 after a previous building, built exactly one hundred years earlier, was torn down (see Flasch/Schwebach window). 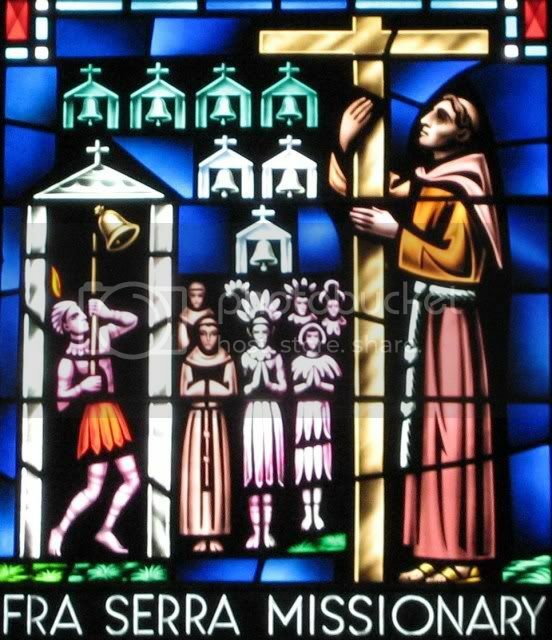 Window themes and panes were designed by three priests from this diocese: Fr. Albert Thomas, Fr. John Mauel (pronounced "Mall"), and Fr. Thomas Reardon. All are now deceased. The designer of the windows in the nave (that's where the worshippers are seated and does not include the altar area where the celebrant is) with the exception of the clerestory windows (the ones where the second floor would be if there was a second floor) was Leo J. Cartwright of England and all of the windows in the entire cathedral were executed by Erhard Stoettner of the T. C. Esser Company of Milwaukee. 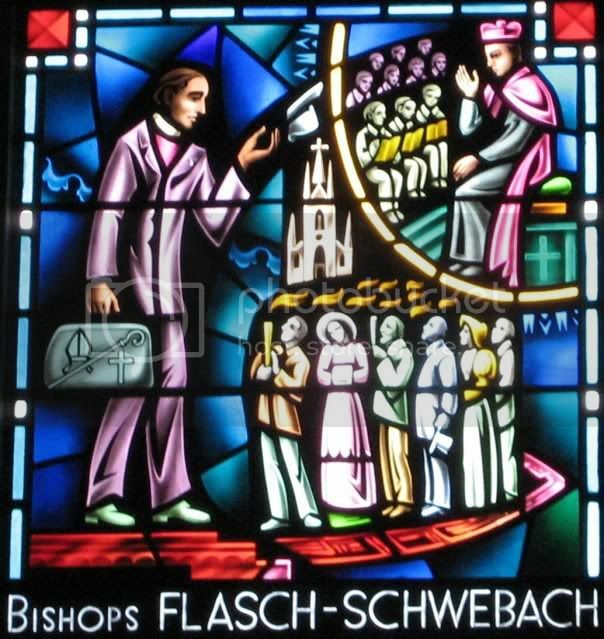 According to Wikipedia - The following bishops are buried in the Blessed Sacrament Chapel of St. Joseph the Worker Cathedral: Flasch, Schweback, McGavick, Treacy, Freking and Paul. Heiss is buried in Milwaukee and Griffin in Chicago. Each of 10 La Crosse diocese bishops has shouldered particular challenges. 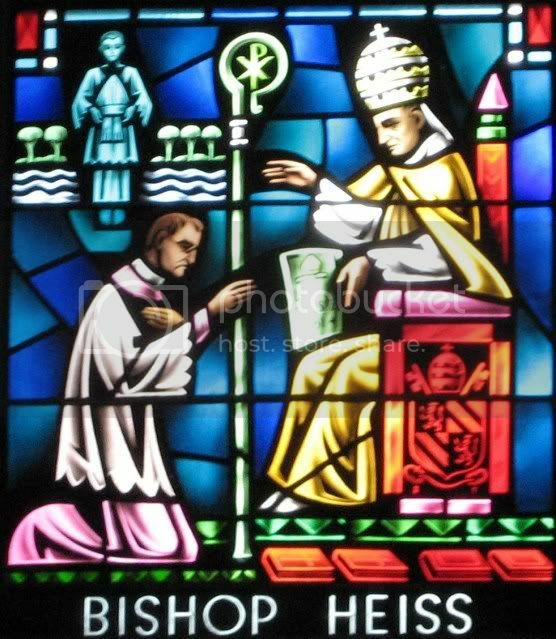 In this window Bishop Heiss is receiving the mandate for the creation of the diocese from Pius IX in Rome while the faithful awaited his return to La Crosse. In the upper left hand corner is a member of the clergy with Heiss' miter and river bluffs in the background. In the window Flasch is standing and Schwebach is seated. Both men were great supporters of Catholic schools. Schwebach is shown in a classroom with students. The church shown is the old cathedral. 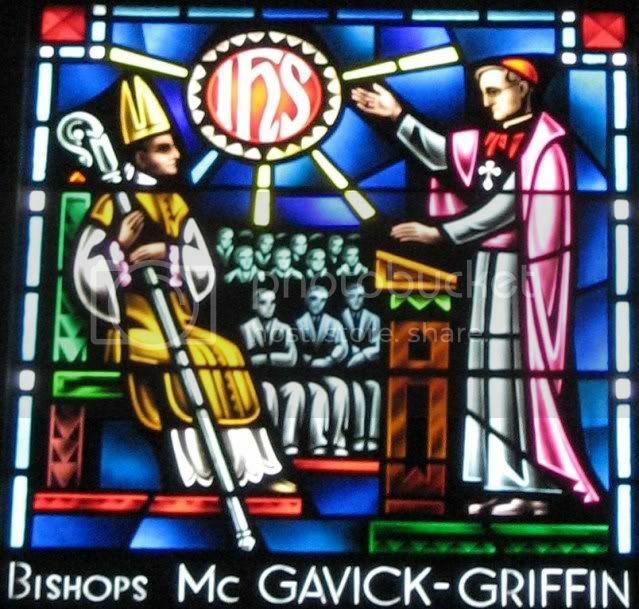 William Richard Griffin (1882 - 1944) was Auxillary Bishop for the Diocese from 1935 - 1944. In the window McGavick is standing and preaching. Griffin is seated. 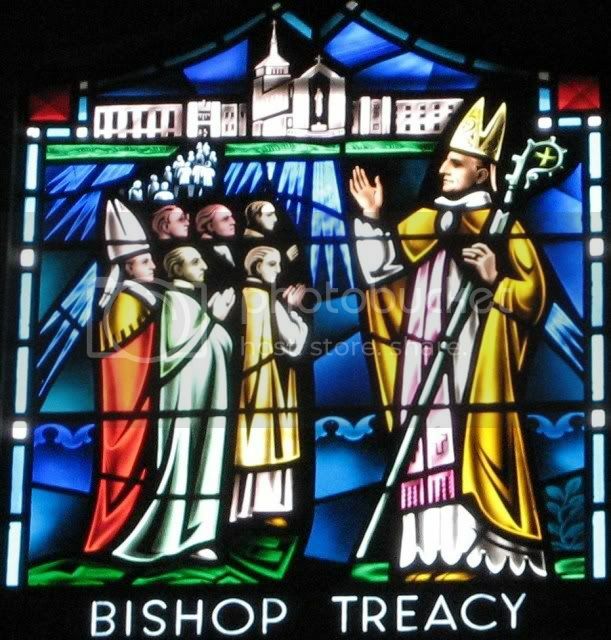 Bishop Treacy was the builder of St. Joseph the Workman Cathedral and is thus the last bishop shown. The building in this window is not the new cathedral but is the current diocesan headquarters housing the Catholic Charities and the Catholic Times offices. 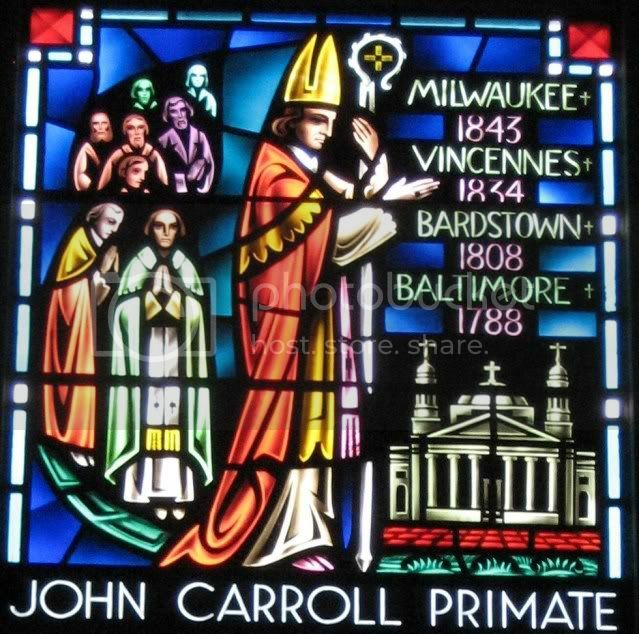 John Carroll (1735 - 1815) was the first bishop of the United States and was based in Baltimore, MD. He played a huge role in shaping the Catholic church in America and in bringing about the freedoms that all have in this country to worship in their various faiths. His brother, Daniel Carroll, signed the Articles of Confederation and eventually donated the land for the U.S. capitol. His cousin, Charles Carroll of Carrollton signed the Declaration of Independence. Daniel was unable at first to participate in politics because he was Catholic. Those laws were changed in 1776, perhaps because of the fondness people of all religions felt toward his brother, Bishop John Carroll. Bishop Carroll did not spend any time in Wisconsin. The dates and places listed on the window are some of the territories that the diocese of La Crosse was once a part of before it was established as an independant diocese. The building is the original Baltimore cathedral. Going to Annapolis? Interested in learning more about John Carroll? Check out this article.